Almost since this series began, I’ve been writing about things that writers, especially new ones, have trouble with. This post is the last of that string. Next time I’ll begin a short series on how critiquers should respond to things a writer did well. Positive critiques are at least as important as corrective ones, so that’s a set of subjects we can’t and shouldn’t avoid. Formatting a manuscript is a simple and almost purely mechanical process, yet it’s one new writers may not have had any training on, or they were trained on formats that aren’t appropriate for fiction manuscripts. This might seem like a minor point, yet if an author intends to follow the traditional publishing route and submit their work to literary agents or directly to publishing house editors, an improperly formatted manuscript is almost sure to garner an immediate rejection, unread. Agents make no bones about this: If a manuscript isn’t formatted to industry standards, they immediately question whether the author really knows what he or she is doing. The work already has 2½ strikes against it, even before the agent or editor reads a single word—if they do. So, here are the standards for the US (and, I presume, Canada, even though they use metric measures). European and Asian standards are different and I don’t have any idea what they are. Justification: Use a “ragged” right margin, that is, one in which the last letters of each line do NOT align vertically, except by coincidence. Fiction and memoir: First line indented by 0.25” to 0.3”, with NO additional spacing after the last line of the paragraph. DO NOT use tabs for these indents. 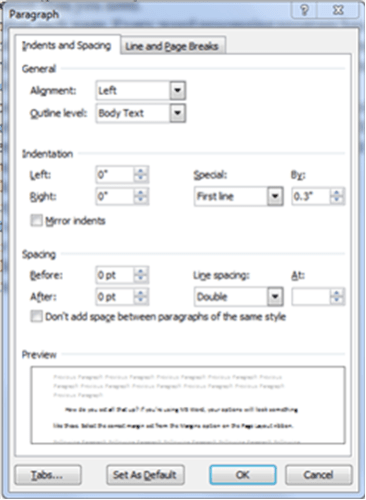 Word processors have controls in their paragraph formatting function that will set this indent automatically every time a new paragraph starts. Exceptions: At a scene break, insert one blank (double-spaced) line. At a chapter break, start a new page or insert about three blank lines. Page numbering: In the header of every page, include the work’s title or a shortened version of it, the author’s last name, and the page number. For example, the header for the manuscript of my WIP Chrysalis looks like this: Chrysalis / Lampert / 137. Font (type face): Twelve point Times New Roman (or its Apple counterpart) is the industry standard. “Sans serif” fonts like Arial, Calibri, or Verdana can be acceptable as well but scientists have found that fonts with serifs (those little angular tips at the ends and corners of letters) are actually easier to read. This post is in Times New Roman. Widow and Orphan control: Turned off. “Widows” and “orphans” are the first or last line of a paragraph left by themselves at the bottom or top of a page. A word processor’s “widows and orphans” control keeps these from happening. This is fine for book or article typesetting but unnecessary for a manuscript. Automatic hyphenation: Turned on. While automatic hyphenation software sometimes produces odd breaks in words, like the word scene being broken as sce-ne, this function prevents blanks at the ends of lines where a long last word was too big to fit. Every word processing program has its own methods for controlling all of these settings, and trying to give instructions on how to set them is beyond the scope of this article. Writers need to learn how to set their manuscript up to follow these guidelines. Many, if not all, word processors allow users to create a default or standard collection of these settings—Microsoft calls them “styles”—which lets the writer set them and forget them. Knowing how to use “styles” or their equivalents can be extremely helpful if a writer wants to do their own formatting for ebooks or print-on-demand publishing. Why should a reviewer even bother with this? Several reasons. First, it’s a matter of instilling a sense of professionalism in the writer. If the writer learns to do this right, it’ll become natural for them to do other things right as well. Second, it’s really easy to do right. Set it up once and it’s done from then on. Third, once it’s fixed, it’s a distraction that neither you nor the writer will have to deal with again. Any thoughts on manuscript formatting? Share them in the comments below.